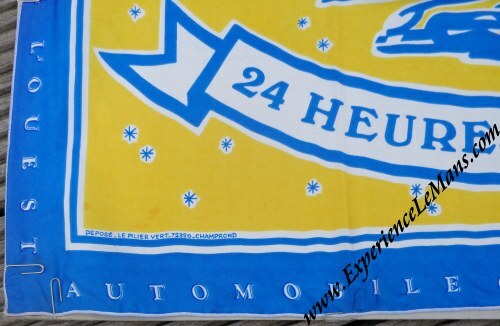 Vintage 1973 24 Hours of Le Mans Silk Scarf. 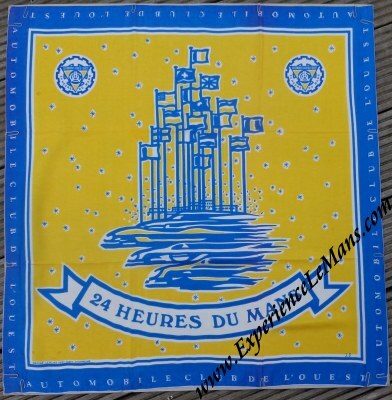 This is a very scarce 24 Heures du Mans scarf which looks to be made of silk (not 100% sure about the material though). The design (signed J.F.) follows the design of the 1973 program booklet which is very different from that of the poster as there is no hint whatsoever towards the race track or national pride. The global aspect is highlighted by the illusion of speed and the flags towering high over the cars speeding by. 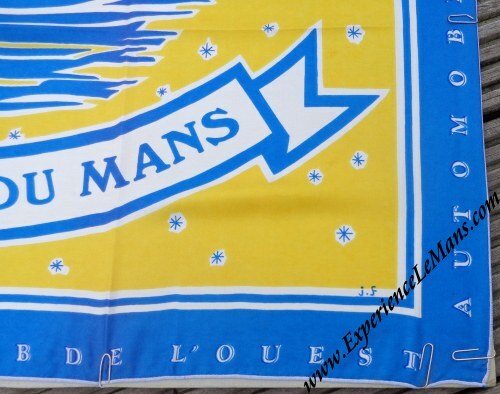 The scarf was printed by Le Pilier Vert in 72320 Champrond, France, the same print-shop that printed the poster in 1972, 1973 and 1974. 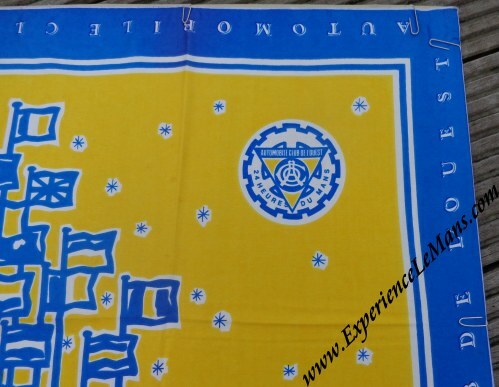 It measures some 65 x 67.5 cm and is in excellent condition considering it over 40 years old now. A fantastic relic from an era gone-by and one of the few surviving examples (the first we have ever owned!). Please note that the scarf is being held to a kind of back-board by paper-clips for the photo, to keep it flat. It will be shipped folded along its original fold-lines. The 1973 race was won by Henri Pescarolo and Gerard Larousse in their # 11 Matra Simca MS670B with a total of 356 laps to their name. For the full results of this race, please see 24 Heures du Mans results 1973.